We are pleased to announce the exhibition TIME – DRAW, a group show including drawings by six artists of the gallery: Katharina Hinsberg, Thomas Müller, Danica Phelps, Sebastian Rug, Hanns Schimansky and Malte Spohr as well as drawings by Pia Linz and Christian Weihrauch. The artists share a decades-long artistic occupation with a theme and its implementation with the means of drawing. If one looks at the exhibited works and deals with their development processes, time seems to be an endless resource for artists. The viewers are invited to take their time to look attentively to get an idea of the time bound in the drawings. Katharina Hinsberg poses fundamental questions about time, space, and the subjectivity of drawing. She uses a scalpel to cut out little parts of the paper creating lines, grids and patterns. Thomas Müller: Every new drawing produces what is missing, every drawing is a knot that extends and stabilises the fabric. My work grows through repetition and variation. A constantly changing network of references evolves. The new works of Danica Phelps from 2018 are showing the monthly income from her rental properties and everything that she spent that money on, each stripe represents $10. A set of individual drawings from 2009 is entitled “Nursing” and depict the babys hands during breastfeeding. Sebastian Rug: If the world consists of only one thread by carefully following its course we could observe the formation of things. Drawing leave traces. 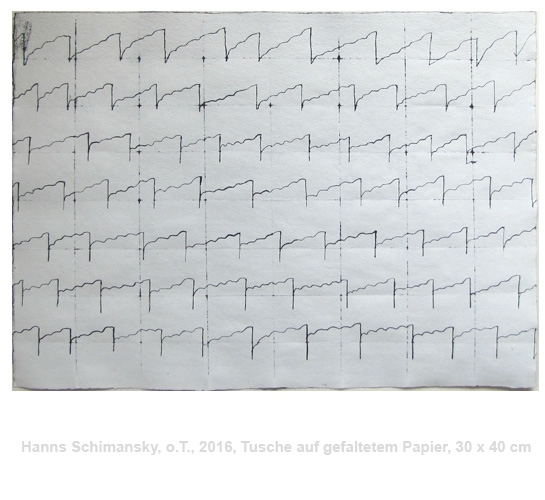 Hanns Schimansky about drawing nowadays: Opposing something to that vertiginous media world. Slowing down. Drawing is for me a concerted handling of medium. Malte Spohr: The drawing develops in a gradual process, and time becomes visible in its density and intensity, like in the annual rings of a tree. Christian Weihrauch: I am dedicated to draw actual things whose appearence interests me in the process of transformation of viewing and drawing. Meaning or symbolism of the motifs stands in the backround in favor of their materiality and their imagination.